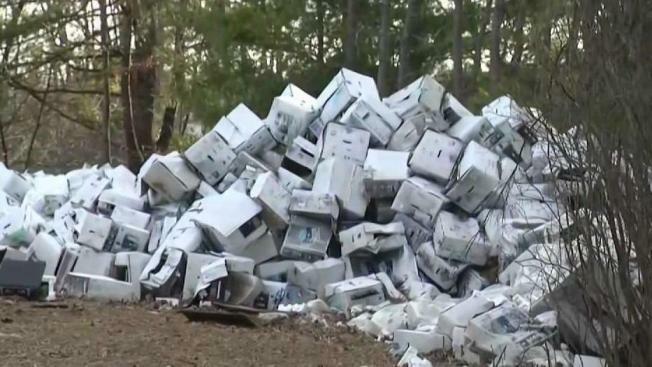 A homeowner in New Hampshire is being sued by his town for failing to clean up his property which consists of a slew of printer boxes. A Salem, New Hampshire, homeowner is being sued by the town for failing to clean up his property. The man's neighbors told NBC10 Boston that printer boxes have been piling up outside the Maclarnon Road home for the last year and they are simply fed up. She says she’s worried about her family’s well-being. “My biggest fear is it being a health hazard to my kids,” Callahan said. Neighbors say it's a town ordinance violation like they’ve never seen before. “The whole situation is odd, something very peculiar,” said John Manning who lives across the street. Residents say it all started last spring when Michael Bates, the property owner, got several shipments of new printers dropped off at his house. “At first it was like, ‘this is funny and bizarre, whatever,’ and now it’s like, ‘what is happening.’” Callahan said. Town Health Inspector Brian Lockard says it was initially a zoning violation for running a business out of a residence. “The homeowner had this business of purchasing printers and removing components, the cartridge, and selling those off and recycling the printers,” Lockard explained. But when the homeowner failed to remove the printers from his property, it became a health violation. Lockard got involved in November. He and other town leaders have ordered Bates to clean up his property several times but to no avail. “He claims he’s trying, but obviously it’s the cost that’s the biggest hurdle,” Lockard explains. He says it will be upwards of $13,000 to remove the printers. Now, town leaders are taking Bates to court, asking a judge to allow them to step in if Bates doesn’t do the cleanup himself. “We’re going to get it resolved, we’re not going to stop,” Lockard promised residents. Both sides are due back in court on April 15. NBC10 Boston tried to reach Bates for comment but Lockard says he doesn’t live at the Maclarnon Road property anymore and he couldn’t be reached at his listed address.